I remember the capacitors of old. I installed one in an FC Holden once. The unit is enclosed in an Aluminium extrusion. The Earth is attached to a copper ground rod. On the basis of "Ferrite" being "iron," I enclosed both cables in a steel tube. It didn't work. I could replace the cables with a single cable each. It would seem to be a false economy for the supplier to include 4 cables to make up the required cross sectional area. Also, the unit is tripping out when the washing machine & computer plus desk fan is running. The error message says that not enough power is getting to it from the batteries and I should replace the cable with the supplied one. Well, I might replace the supplied with One + & One - of a cross sectional area of about 78mm^2. Maybe that will help. Then look for the Ferrite etc. Really, I'm not sure what I expected from a unit that was about $350 compared to,say, a Redarc that was $3,500. I could (gulp) replace the "Solar River" Grid inverter with an Hybrid unit and use the batteries there. That would of course, lay waste the Edacoa Inverter, panels, cabling & VR. And wouldn't be half as much fun. Comment from Boss:- "I'm plugging the washing Machine into the real electricity. That doesn't work now along with my radio." Now, as for the capacitor, I'm looking at the earth and the +ve. Should I attach that way? As an aside, the 4 x 100 amp/hr batteries (200 amp/hr available) should give me 2400 watt hours to use overnight. 3kW on grid. Solar River PV Grid Tied inverter 3000TL. Rene Solar Panels 12 x 250. Solar Hot Water. 960 watt Solar off grid with 3500 watt inverter. 4 x 100 amp/h batteries. It's not so much a matter of shielding, which is what your steel tube might do, as blocking and dispersing specific frequencies, as heat. The size of the choke will relate to the frequency you're trying to get rid of. Googling might give you some guidance on the frequency and the matching choke. Primary system: .8KW Trina panels; Plasmatronics PL40; 1,000Ah VRLA 12X2V battery bank; 1.7KW Selectronic inverter. Off grid for 30 years. I've read the Wikipedia link that you posted. I have just ordered some teroids from RS Components and purchased new cable. On checking the battery bank it was 14.4. I hung around for a repeat performance (after resetting the inverter) and was rewarded by another alarm and, having left the Multimeter attached to the batteries, it did indeed show 15.4 briefly. So it seems that the VC was allowing a Spike. So, I disconnected the Cells & then the batteries. Waited. Reconnected the batteries & then the cells. I did use it this morning to run an electric mulcher. At one stage the mulcher jammed , which tripped the inverter. Next time I get this Mulcher out, I'll repeat this & check the amps. I have noticed that the cheap solar regulators can be very slow responding to fast changes. For example your situation where the inverter draws a large starting current from the batteries so the voltage falls for a moment. The solar reg switches on the panels fully but the batteries recover fast, The 'brain' in the reg does not look at the system for a finite time to discover the change so the voltage goes up until the next check when it then corrects it. Not usually a problem as things normally happen slowly. I see this sometimes in my camper. The voltage monitor sometimes shows a red light when the motor runs and the solar is charging also. As for connecting the capacitors. Try one just across the DC input close to the inverter. Then if not good two from each to earth or even all three together. No disadvantage to have them on there anyway. Make sure you get non polarised capacitors or be very careful how you wire them or you will literally blow them up in your hands if you reverse them. I spent yesterday going through the whole system. The Inverter & the VR has a disagreement as to how much voltage is contained in the Batteries. 4 to 5 volts. So, except for the RF noise, all good. Just waiting now for the Torriods. With the capacitor, as it's an alluminium case, should I attach to the Earth on the Inverter & the + input? I am now confused about your current system. What nominal voltage are you running at. The battery configeration ? 4-5 volts is a big discrepancy in the reading between the units. They are usually not precision meters. What does your meter say is the bad unit reading. or both ? Your voltage may be a bit high for a car capacitor to work at full time, if that is the type you have for the interference. It might be better to get a couple of higher voltage ones if you want 100% reliability. Who has a suggestion as to the type. Whoops! How about 0.2 to 0.5. And set the VR to 14.1. The Multi-tester is somewhere in between. So, currently, the inverter is reading 14.5 & The VR = 14.2. When I disconnected this about a week ago, the VR reset itself to Factory settings, which is Absorption = 14.5 & Lithium. I've now changed to 14.2 & Lead Acid. I didn't check this until this morning so I'm expecting that to be OK now. This morning, though, early, I had a voltage of 25 Volts from the cells. It's currently at 40 volts Amps @ 2.61 & Power @ 106 W. Full sun and 2.15 pm. I can't recall the amps (Power was over 300 watts) but it did follow Ohm's Law as the more recent measurements do. I thought that the volts should be almost constant from the cells, the amps & therefore power varied. Do not worry about what the panels are putting out. 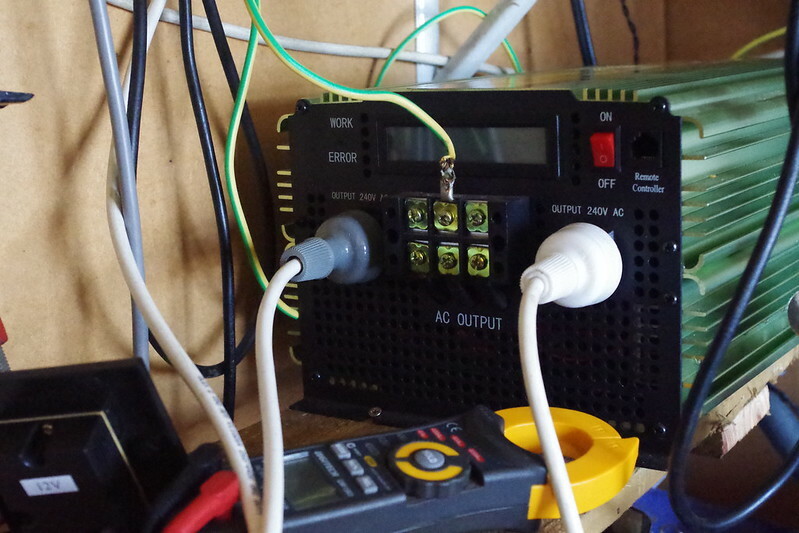 The MPPT regulator will juggle the panel input to try and get the best power out of them in bulk mode. So the voltage may go up and down a bit depending on various circumstances. Then after the battery voltage gets up to the set voltage the panels are turned on and off to keep the battery voltage under control and at the correct average value. So the power falls off because the battery is almost charged and later in float mode. Just keep observing the system to get to know what is does at different stages of charge and the different voltages. That capacitor will be OK for your system. Try it both ways. It's a little odd that you're getting 25V at the cells [I presume that's measured across the connectors?]. With the settings you're using it shouldn't go much above the 14.5V figure. It could be, that the connection between the terminal posts and the terminal clamps isn't as good as it should be. This might also explain why you've had trouble running the fridge. Maybe you could check to see if there's a difference between the voltage measured across the actual terminal posts and the voltage measured across the terminal clamps/connectors? 1) Sort out wiring. Fit new cable. 3) Buy 1 MFD non polar For an AM set, use a parallel capacitor with a single lead. 5)Check voltage at DC inputs. P.S. There's been no further problems since I reset VR. 6 Panels of 160W. Wired 3 sets in series. Thence in parallel. 3500 watt Edecoa PSW Inverter. 4 x 100 amp/h deep cycle lead acid batteries. For the record 400 amp wind turbine with own VR tethered & shorted at present.